Editorial: Can Hip-Hop Be a Voice of Change in 2016? I've been on both sides of the nostalgia debate in the past - I've fondly reminisced about record stores while also noting the 1980's aren't as great as you might think in hindsight. That proves that I'm either as changeable as the weather in the Midwest from day to day or that my editorials might be based entirely on my mood the day that I'm writing them. I believe that both have a good point though - there are parts of the 80's some of us might miss (like physical brick and mortar music stores), but if you spend too long reminiscing about the past you miss out on what's going on in the present and won't be part of the future. 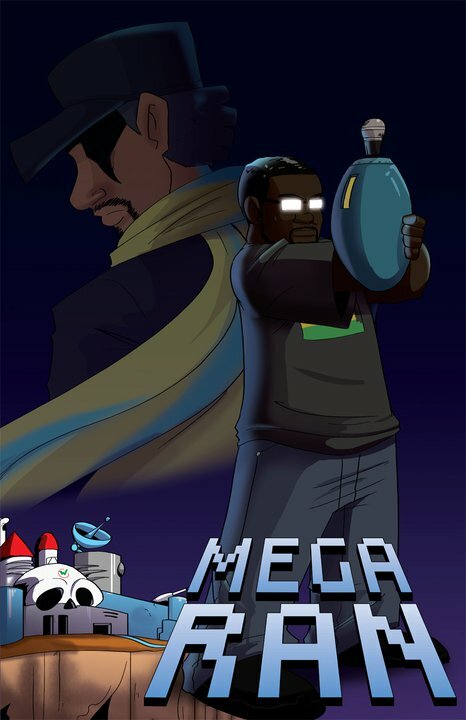 Thankfully there are some artists in hip-hop who are capable of bridging that gap, and as you might have guessed from the graphic to the right Mega Ran is just such a man. He's got one foot firmly planted in fond memories of being a video game enthusiast as a kid, but his music is also carrying us forward into the new millennium with modern day topics, flows and production techniques. It's possible to have the best of both worlds in hip-hop, just like it's possible to be on both sides of the coin in different editorial pieces. I frankly can't be mad at any hip-hop artist who can take the Afrocentric stylings of Boogie Down Productions or righteous protests of Public Enemy and update them for the 2010's and beyond. The question then is why more artists aren't at least TRYING to make music with a message, whether they're familiar with the roots of modern day rap or not. We can't lump all of 2015's most successful rappers together into one category and say none of them made any effort, but it's hard not to notice that pop rap has become incredibly escapist entertainment that often has little to do with the day to day realities of anyone in or outside of the major urban centers of this country. There seems to be a new dance fad every month or two, there's a new way to party, a new expensive liquor to consume, and even respected journalists like Lisa Ling admit they've popped a Molly. Based on the amount of swimming pools full of liquor rappers seems to want to dive into, you might be cynical enough to think that hip-hop with a message is dead - long live the Party Rock lifestyle. After reviewing J-Live's latest album last month, I've been reassured that my faith in hip-hop music's message is not misplaced. I said with nostalgia there needs to be a healthy balance between respect for the past met with vision for the future. Hip-Hop's message can include the party, but after every party there's the rest of your life to go on living, and the party is a temporary escape at best. Hip-Hop may have been a little overloaded on having a good time lately, but if it's in response to a world of police brutality, racism and disenfranchisement a little escapism is natural and healthy. It's also healthy to not go on partying to escape forever when the reality is that #BlackLivesMatter and things aren't going to change unless everybody stands up to DEMAND that things have to change. The Coup has consistently shown over a two decade span that they can make fun music but also convey a serious message about the problems in our society. I'd like to see hip-hop remember to strike that balance in 2016, with maybe a little less emphasis on numbing yourself to the pain of the world through drug and drink, and a little more emphasis on making the world a less painful place to live in. Hip-Hop has always been a voice of the voiceless, so I'd like to see 2016 be a return to making that voice heard more loudly and clearly than it was among the sung rap flows of 2015.